The following conversation between Matt Zoller Seitz and me was originally published at Indiewire. A reader recently asked me if I could redirect him to that conversation. I told him that his timing was uncanny, as I was just about to share that dialogue with students in my “Film & Faith” class at Seattle Pacific University. But when I looked it up, I discovered that something has gone wrong with the formatting of the piece at that original location, making it difficult to read. Unable to edit that website myself, I inquired about publishing the piece here in an updated format. 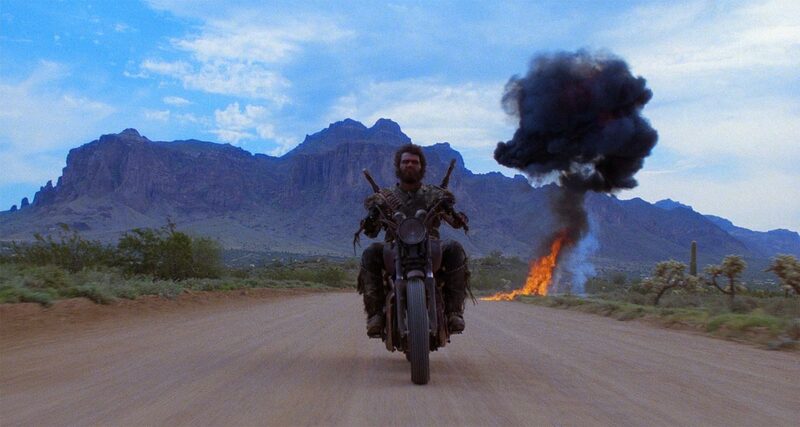 So, I was watching Raising Arizona for the 400th time the other night, and laughing at the sheer Freudian-Jungian comic bookish-ness of having the lone biker of the apocalypse appear in conjunction with the hero, H.I. McDonough, having a dream. It’s almost as if he was summoned by the hero’s dream—as if he’s a metaphor made flesh. You can see the biker as a physicalization of the hero’s internal struggle to put down the outlaw within, and become domesticated. The biker is an id creature erupting from inside of H.I.—the return of the repressed, I guess Freud might say—only he’s riding a giant Harley and he’s got shotguns and grenades. And then I started to fixate on something else: the sense that there’s an equally strong religious or spiritual dimension to that scene. It’s as if the biker is a demon being summoned like a supernatural creature from a horror movie or an ancient folktale. Ed doesn’t call him a “warthog from Hell” for nothing. And this in turn got me thinking about all the other instances in Joel and Ethan Coen’s filmography where it seems as though supernatural forces, or at least nonrational or uncanny forces, are at play—where what you’re seeing doesn’t quite seem to be metaphorical, if you know what I mean. There’s an angel and a guardian angel in The Hudsucker Proxy, and the actual stoppage of time. The villain in No Country for Old Men seems like Satan himself, or a demon from hell, not unlike that biker from Raising Arizona. The bad guy in The Ladykillers is basically Satan, doing battle with an old widow, and their dynamic recalls Robert Mitchum and Lillian Gish in The Night of the Hunter, which was a Manichean story that quoted the Bible and from folktales and fairytales rather liberally. 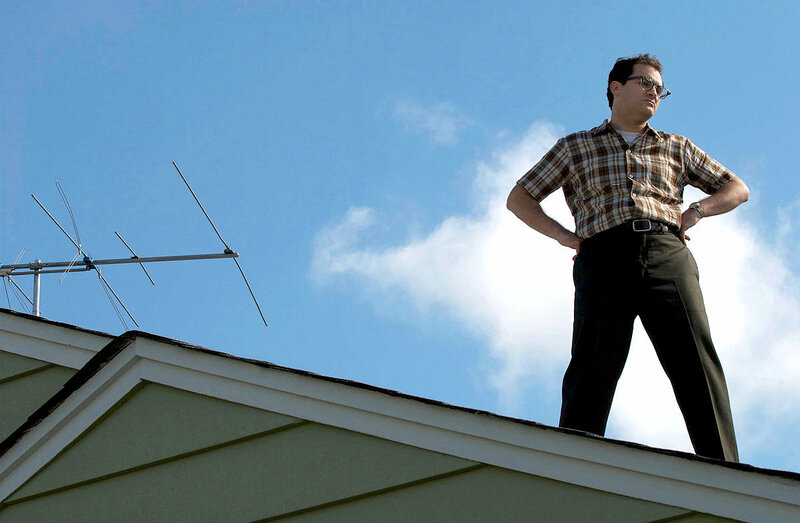 A Serious Man draws on Jewish theology and folktales quite pointedly, and it ends with what looks rather like a miracle, or maybe a curse, or the apocalypse; and in any event, the film seems to connect with No Country for Old Men, which also has a fire-and-brimstone, or Revelation, kind of vibe. And at a certain point I just thought, “I need to get Jeffrey Overstreet to talk to me about this, and see what he thinks.” Jeffrey is a novelist and one of my favorite film critics. He writes with great lucidity and compassion about all sorts of movies, from all sorts of angles, but what I value most about his work is the theological-moral perspective he takes on things. He’s not a dogmatic scold, sifting through popular art looking for work that fits a rigid world view; he’s more interested in Looking Closer, as his blog title suggests, to discover what, if anything, the work is saying. That’s what I think he does in this conversation. Do the Coens believe in God? Can we even say that for sure? Do they believe in the non-rational, the supernatural? Or are they just pranksters pulling our chains and hoping to spark conversation pieces like this one, while they sit there snickering? What do you think? As Emily Dickinson says, “Success in Circuit lies….” So, forgive me, but I’ll get to that question about God in a circuitous fashion. Anyway, that scene is not only resonant with apocalyptic, supernatural implications — it’s intriguing in that it serves as one of several portals into their other films. It’s one of those recurring motifs, those strands of thread that stitch the Coens’ whole body of work together. 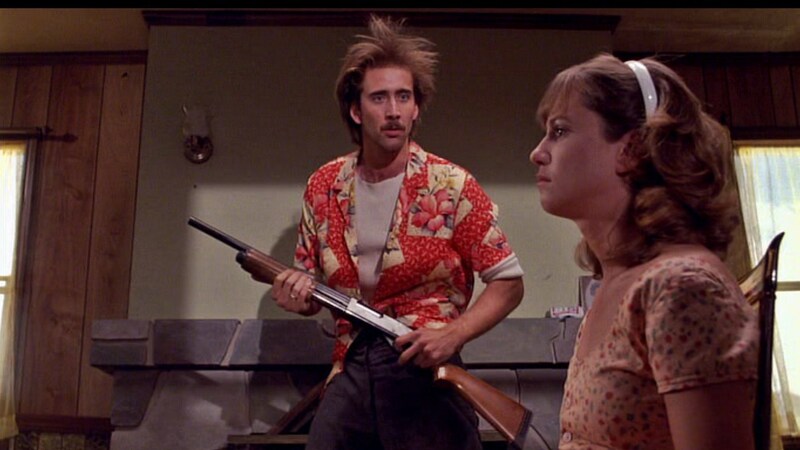 Raising Arizona’s H.I. has the Lone Biker, who greatly resembles Sheriff Bell’s nemesis in No Country for Old Men — Anton Chigurh. Both are lone figures of chaos, wrath, death, and judgment, prone to blasting “the little things” (bunnies, birds) and the innocents. In fact, there are shots of H.I.’s troubled sleep, in which he dreams of apocalyptic things, that mirror Llewelyn’s troubled sleep after he brings the money home in No Country. There are strong connections between H.I. and Llewlyn, fools-in-arms right down to the way that their stolen goods drag them down into much darker and more frightful trouble. The allure of “what other people have” — money, a family, power, fame — is the pathway to hell for so many Coen characters. But there are a variety of crooks in the Coens’ world. There are boneheads like H.I. and Llewelyn, who take what doesn’t belong to them and regret it. There are power-mad figureheads and CEOs and “Men Behind Desks” like Waring Hudsucker in The Hudsucker Proxy and the Big Lebowski in the film that bears his name, and the Hollywood studio execs in Barton Fink, and Leo in Miller’s Crossing… crooks who are insulated and egomaniacal, corrupt and rotten to the core. There are flimsy fools of apathy and inaction, like Larry Gopnik in A Serious Man and Ed Crane in The Man Who Wasn’t There. Those who insist on forcing the world into order through the power of law —Sheriff Bell in No Country, Tom Reagan in Miller’s Crossing, Rooster Cogburn in True Grit — end up despairing, unless they act in allegiance to some kind of higher law, embracing mercy and mystery. 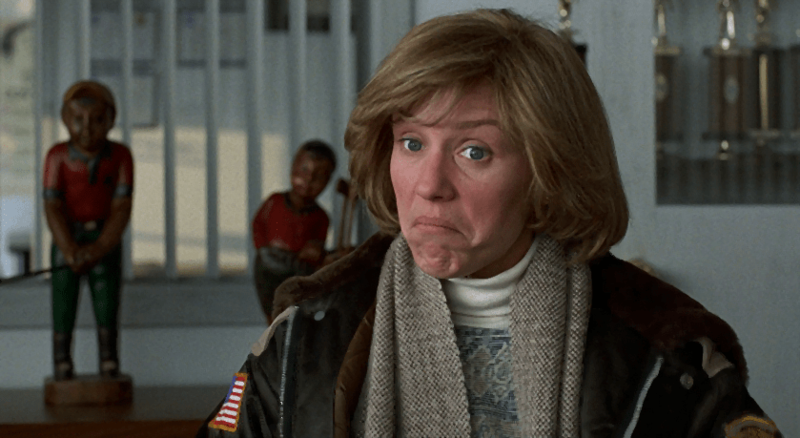 In fact, the only characters I can think of who aren’t seriously messed up are Marge Gunderson in Fargo and Mattie Ross in True Grit. So, back to your question about God: I think the Coens suggest him via negativa. They show the incompleteness and insufficiency of a vision that leaves God out. There are clearly human evils at work —evils of foolishness, carelessness, folly, and evils of greed and deliberate violence. But there are also evils of apocalyptic, seemingly supernatural proportions. As No Country demonstrates, good deeds and the power of law are not enough to save the world. Ultimately, the best we can do is seek justice, love mercy, and walk humbly in the presence of something greater than ourselves. It’s very elusive, very tricky, very coy, I guess you could say — the way they deal with these issues, or don’t deal with them. From Blood Simple onward, the Coens have offered up plot after plot after plot wherein good and evil square off, but both good and evil are as comical as they are formidable. Good is noble but rather dull, or conventional and predictable. Evil—or corruption—is more exciting, I suppose, or at least superficially sexier than good, but kind of pathetic in the long run. Anton Chigurh is distinguished by his isolation and his grotesqueness. The crooks in Fargo bang prostitutes in hotel rooms after a Jose Feliciano concert, and seem to last all of ten minutes before Johnny Carson comes on; meanwhile, Marge Gunderson and her husband seem truly satisfied in their “boring” suburban home, in their shared bed. In the Coens’ work, the settled, slightly boring but essentially satisfied “good” collides with the evil, the chaotic. And the fate of the world, or at least these characters’ own little world, is at stake. But here’s the really interesting part for me: in a Coen brothers film, you can never be entirely sure if good really defeated evil or if evil destroyed itself, through overconfidence or inattention or just plain bad luck. Luck is such a huge factor in the Coens’ work. Blood Simple, Raising Arizona, Miller’s Crossing, Fargo, Barton Fink, Burn After Reading and so many other Coen brothers films have plots that seem driven by mysterious clockwork forces that could either be weighted in favor of “good” or not . . . . But then again, you kind of can’t tell. And while I think I know what the Coens think of their bad guys, I can’t be entirely sure if what I’m seeing onscreen is a condemnation, however comic, or merely a presentation. Are they moralists, or are they anthropologists? I think they’re out to subvert the whole “white hats versus black hats” view of the world. I think they do believe in good and evil, but they seem to see all of humanity as having one foot planted in both camps. Their character cannot be “the Good,” but the more they “lean in” toward love, the more peace and hope and goodness they find. Think of H.I.’s final dream, the one about growing old with a family and feasting. Think of Marge and Norm celebrating the 3-cent stamp and the upcoming baby. Think of how the most moving and inspiring moment in True Grit comes not when Cogburn blasts the bad guys, but when he carries Mattie across miles and miles trying to save her. The more these characters try and crush evil, or to diagnose it with the intellect, or try to make themselves better through the sheer force of will, the more hopeless and sick at heart they become. In the same way, Sheriff Bell in No Country, for all of his efforts, must sit at the table with his wife, confess to a sense of hopelessness and futility, and “lean in” to a dream, to a sense that maybe there is a glimmer of hope, but it exists beyond our control. Even Mattie Ross, for all of her righteous anger, pays a heavy price for trying to fix the world by force. After she is “disarmed,” she seems to realize that the greatest reward of her adventure was not justice achieved by violence, but the mysterious bond that formed between her and Cogburn, who strove so mightily to help her. The Coens’ paint a picture of a world botched beyond belief, and beyond humanity’s capacity to repair. But there is something transcendent about what those characters who know love enjoy. They touch something that operates in, through, and beyond the human sphere. I want to dig into this a bit more, this sense that bedrock Judeo-Christian concepts inform the Coen brothers’ filmography. I think it’s self-evidently true to say this, like saying that David Cronenberg is fascinated by the fragility of flesh and its overlap with technology, or that Steven Spielberg has daddy issues. But at the same time, it’s an observation that conflicts with the popular perception of the Coens as being cold or disinterested moral relativists—or at the very least, film school pranksters, guys who are all about homage, and who don’t believe in anything, really. They certainly do hold their cards pretty close to their vests in that regard. But maybe not as close as detractors might say? What you say about surrendering to a higher power, or to the possibility of enlightenment or even “rapture,” as a Christian might put it, runs throughout Joel and Ethan Coen’s filmography—that sense that you have to let go, to surrender to cosmic forces rather than fight them, and let the universe sort itself out. That’s not to say that the outcome will necessarily favor Good, or even favor you personally—just that, as the films tell their stories, the universe has a way, and we don’t necessarily know what That Way is, and ultimately we’re all just drifting through, like the tumbling tumbleweeds in The Big Lebowski. Do the Coens want to try to make sense of any of this? I don’t know . . . There are times when they seem as baffled as the rest of us. They certainly have a fondness for narrator characters who try to put everything in perspective and fail miserably and very amusingly. The narrator Moses—what a name!—in The Hudsucker Proxy, or Sam Elliott’s cowboy in Lebowski, kind of lose their places as they’re trying to put a frame around things. The Coens seem to get a kick out of tantalizing us with answers while laughing at the very idea that there could be answers. Well . . . they sure don’t seem to think we’ll know answers on this side of Sheriff Bell’s dream. But there is something out there. There is somebody running the clock. I’m uncomfortable with the term “moralists” when it comes to the Coens. Mere moralism isn’t enough. Moralism is just arithmetic: A fool plus his money are bound for hell. That’s not an accurate summation of their sensibility, because look at how the loving and the righteous and the innocent die miserably in their films. Exhibit A: Lana, from No Country. “Karma” is far too narrow a concept for the Coens. Furthermore, there is too much respect for mystery in these films for the storytellers to be mere moralists. Now, I don’t think the answer is to start trying to pin a religion on them. A Serious Man makes it painfully clear that religion can become like Arthur Gopnick’s book “The Mentaculus” … a labyrinth of laws and reasoning that ends up making as much sense as the absurd, self-contradicting legal defense of Ed Crane in The Man Who Wasn’t There. Religion, while it binds communities and brings meaning through ritual, is ultimately not enough. I’m not willing to brand the Coens as “covert Christians.” And even if I did, the word “Christian” is about as meaningful anymore as the word “conservative” or “Democrat”, or the term “the American way.” It means a million things to a million people. But they are definitely drawn to a vision of the cosmos that resonates with my understanding of Christ’s teachings. That is to say that “righteousness,” the ways of religion, and the law-focused method of an “Old Testament” worldview, are ultimately insufficient. We cannot earn our way to heaven by being good. We cannot save ourselves. The Coens know that “all have sinned,” and they know that “the wages of sin is death.” Everybody is likely to die miserably in their movies, whether as a result of their own evil or someone else’s. But there is something out there, some kind of offer of grace, and when we glimpse that, goodness happens in us. We begin to love not for selfish reasons, but as a response, as a reflection, as if we are instruments being tuned up by something greater than ourselves. 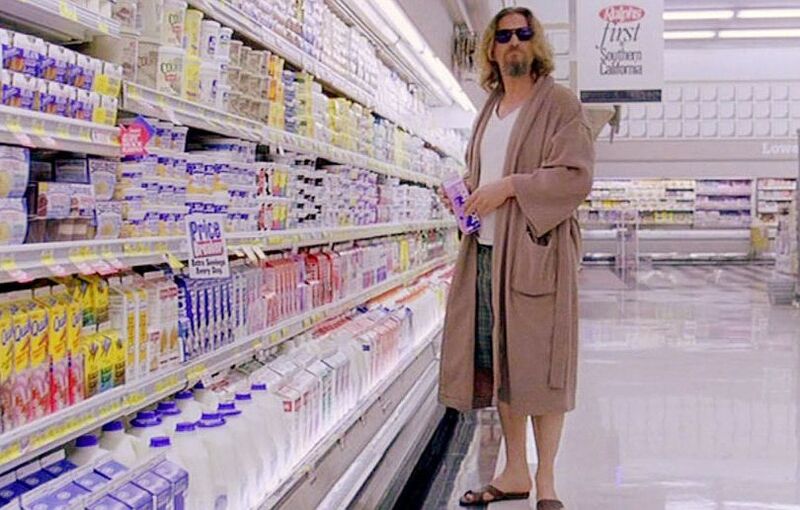 On a side note, while I don’t see anything as simplistic as a “Christ figure” in the Coens’ films, I do love the way some have speculated that “The Dude” himself is a “holy fool” who acts as a sort of signpost toward Jesus. We see him doing carpentry (badly). We see him “taking it easy for all us sinners.” He walks around in a robe, and hangs out with all manner of fools and crooks without an inclination toward judgment. He even bowls alongside a “false Christ” (“The Jesus”). And what does he drink at the grocery? The Coens love the fact that God uses the small and humble people of the world to shame the greater. Well, I didn’t want to come at this head-on, because it seems very un-Coen-like, but you went there first: I take it you believe that the Coens believe in God? Okay, more directly: I think they believe in grace. I think that they’re likely to give the great mystery enough respect that they won’t name him. They’d rather show than tell. Or, if you will — they don’t believe in God, they believe in G-d. That’s my inclination. But then again, many great artists who profess to profound doubts, cynicism, agnosticism, have given us inspiring theological art. Listen to Woody Allen say he doesn’t believe in right and wrong, or good and evil, or God. But then he tells stories about men who, when they commit all manner of sins, are haunted, conflicted, dissatisfied. Perhaps the Coens’ films are another case of the art knowing more than the artists. And that is what should matter anyway. I don’t much care what the artist believes. I care to discern what the art reveals. light allows. When the candle is burning, who looks at the wick? When the candle is out, who needs it?But the world without light is wasteland and chaos, and a life without sacrifice is abomination.” I love that. Give me the work and its mystery. Don’t ask me what the artist believes. Then what do you think the work reveals, about God, about faith, about the possibility of a moral code that can help us make sense of things? I feel like the Coens are very culturally conservative beneath it all, and not anything close to the snickering secular humanists you might think they are, considering their reputation as pranksters. I felt like the Nihilists in The Big Lebowski were the Coens’ playful mockery of critics who’ve called them Nihilists—”Ja, we are nihilists, we believe in nothing!” they repeat, chasing the hero through his dreams with huge castrating scissors. The Coens aren’t nihilists. They believe in something. And yet they don’t spell that something out. It emerges organically while you’re watching their films, maybe because they’re not entirely sure what “it” is, either. They can see the contours but not the details, maybe? It’s tricky and very subjective, what they’re doing, and what we’re doing as we watch they’re doing. It’s like looking for shapes in clouds. You see what you want to see, and maybe you’re right to see it, or maybe if you were a couple of miles in the other direction you’d see something else entirely. There’s an aspect to their work that reminds me of going to Sunday school as a kid, and I don’t mean that as a knock, not at all. It also reminds me of hearing my grandfather tell stories about his childhood by way of moral instruction. They’re illuminating the universe, or at least exploring it. But they’re not going about it in a didactic way. There’s something fundamentally humble about them, as visually and structurally and generically flamboyant as they sometimes are. I feel like they’re figuring things out, too—figuring themselves out, figuring the world out, and laughing at themselves, and the rest of us, for thinking there’s An Answer to anything. what a hilarious and pathetic mess we all — Coens included — make of things. I think Barton Fink has self-critique built into it — they’re making intellectual movies, but they know that even ambitious art like that can only go so far. Their constant nods to Sullivan’s Travels, especially in Hudsucker and O Brother, tell us that they know that there is redemption in a certain kind of self-effacing laughter. I suspect they see themselves as Larry Gopniks… exasperated by the insanity in the people around them, but then capable of perpetuating that same destruction with their own judgmentalism and compromise. Chuck Jones clearly loved his Looney Toons characters. He loved their language, their exaggerated features, their cleverness, their vanity, their folly. But he loved those characters. And his depictions of human folly in the circus of those cartoons was a form of insightful humility, about all of us ridiculous human beings. So I think the Coens’ work disturbs audiences because it reminds us that, contrary to so many Hollywood messages, “being good” isn’t the answer. Being good is good, but—as Bill Murray says in Wes Anderson’s Moonrise Kingdom—it isn’t enough to fix things. Their movies “ring true” when they remind us that there is a “wrath that’s about to set down,” as Rooster Cogburn says. If that wasn’t true, it wouldn’t strike such a resonant chord in audiences. The Lone Biker of the Apocalypse in Raising Arizona is coming, and there’s something elemental and true about him. We ourselves have unleashed him, as H.I. declares. In No Country, we’re warned that we “can’t stop what’s comin’.” There is a moral code, yes, and we violate it in countless ways. We’re screwed. But their work doesn’t stop there. It engages and encourages us by leaving us with moments that transcend all of that doom, all of that destruction. Their suggestion of the possibility of grace is not so much a sermon proclamation as a desperate hope. And it wouldn’t move us so deeply if the anticipation of grace weren’t built into us somehow. It moves us because, on some level, we know it’s true. Can’t thank you enough for sharing this. Helpful as a 3 cent stamp.